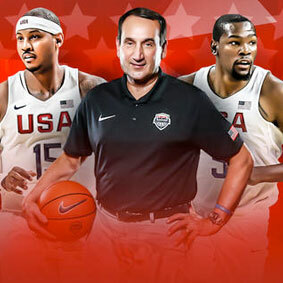 Mike Krzyzewski never thought he would have the opportunity to coach the U.S. men’s Olympic basketball team once NBA players were allowed to play. But the U.S. men faltered, losing to Argentina in the semifinals of the 2004 Athens Olympics and finishing with a bronze medal, the first time U.S. hadn’t won gold since the 1988 Seoul Olympics. The U.S. also failed to medal at the 2002 FIBA World Cup. Apathy set in. Culture, leadership and pride in country were needed. After a search that included a 20-plus-member committee, USA Basketball managing director Jerry Colangelo in 2005 asked Krzyzewski to coach the team. Krzyzewski had just turned down an offer to coach the Los Angeles Lakers in the summer of 2004 when the opportunity to coach the U.S. emerged. For love of country and love of coaching, he was the right coach at the right time: West Point man and championship coach at Duke.